(1847- ) Buffalo Electrotype and Engraving Co., Buffalo, N.Y.
Eliza Frances "Fanny" Andrews was born to a prominent family in Washington, Georgia. Her parents were Annulet Ball and her husband Garnett Andrews, a Georgia lawyer, superior court judge, and plantation owner. She attended a girls' school near her home and in 1857 graduated among the first class of students at the LaGrange Female College (later LaGrange College) in Georgia. She studied literature, music, and the arts, and learned French and Latin. Late in the Civil War, when the Union troops of General William T. Sherman were approaching their home, Fanny and a sister fled to live with an older sister in southwest Georgia. 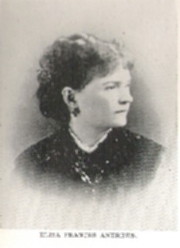 Fanny recorded both her trip and her stay in a diary, later published in 1908 under the title Wartime Journal of a Georgia Girl: 1864-65. A second diary, Journal of a Georgia Woman, 1870-1872 (2002), documented her transition from an antebellum Southern belle to an independent woman. After her father's death in 1873, she supported herself as a writer and contributed articles to The New York World, Scott's Monthly, and a variety of other publications. Her first novel, A Family Secret, was published in 1876. She briefly edited the Washington Gazette, but was fired when the editor discovered she was a woman. She became the principal of the Girl's High School in Yazoo, Mississippi, where she remained for seven years. She then returned to Georgia, where she become the principal at her former high school and then a professor of French and literature. Later in life, she devoted herself full-time to lecturing and writing. Fanny had a lifelong interest in botany and wrote two textbooks on the subject, Botany All the Year Around (1903) for high school students and A Practical Course in Botany (1911) for college students. The latter received international acclaim and was translated into French for use in French schools. Eliza Frances Andrews is currently considered a "single author." If one or more works are by a distinct, homonymous authors, go ahead and split the author. Eliza Frances Andrews is composed of 1 name.